Art at Claudine on Claude Lane, San Francisco. Restaurant now closed. This was big impact art in smaller space. The artists who paint murals and graffiti on the street come from all walks of life and are professionally trained or self taught. Regardless who they are, they all have to earn a living and buy the supplies to create the art that is the raison d’être. Those livings are as varied as the people themselves. Some are fortunate to be full time artists. We have met others who are engineers, architects, programmers, web designers, illustrators, tattoo artists, property managers, bartenders, musicians to name a few. Some work multiple jobs. In the end for all of them it is all about creating the art, pushing the envelope and gaining recognition. Even when they create art on the street, someone has to pay for it be it them or a commission inside or outside. Daily we show you art on the street. Now it is time to go inside and show some of the art they have created for business. The art we are showing can be enjoyed by you as well as their patrons who commissioned the art. We would like you to know where some of it exists so you can support the businesses that support the artists so they can continue to hire artists to make their places unique and another reason to visit. You in turn might be establishing a business and become inspired to hire an artist. Craftman and Wolves is a bakery.The baking is done at the CAW Den on 1598 Yosemite at Keith St location which is also a retail shop with seating. They have retail stores in Pacific Heights and on Valencia St in the Mission District. Is it worth the trek? You better believe it. For starters they are the first bakery we have visited that makes an actual valrhona chocolate chocolate croissant – not the traditional pain au chocolate. They have some unique pastries with delicate flavors. Art is by Heather Day. The Laughing Monk Brewery is on Egbert at 3rd St in the Bayview District of San Francisco. 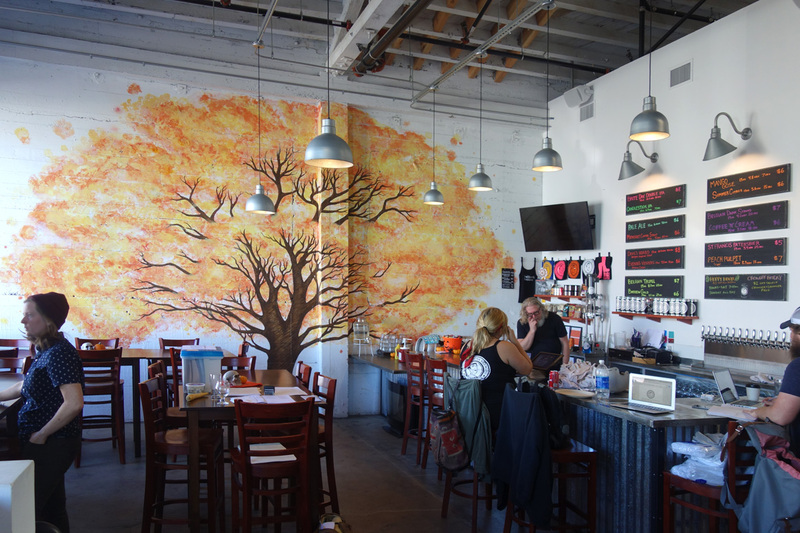 There is more art inside this brewery that crafts many varieties of California and Belgium style beers. 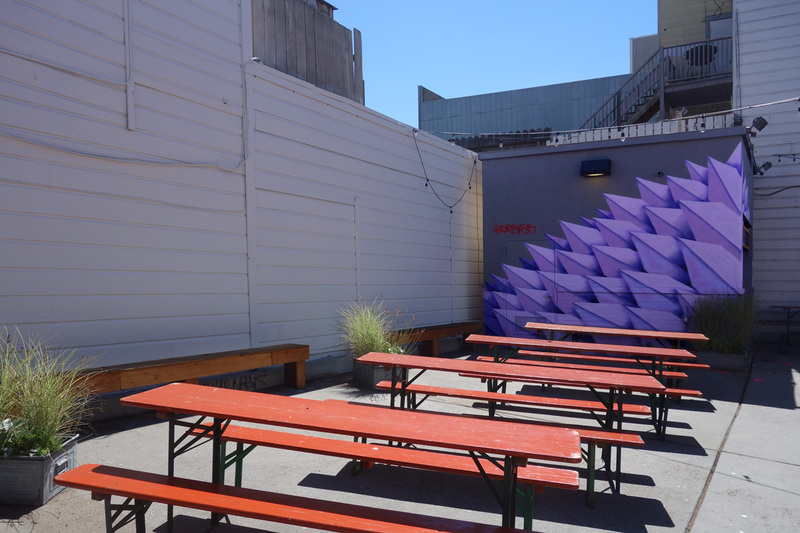 The owners were instrumental in the Sprayviewsf project that created an art district curated by Cameron Moberg right outside their door that can enjoyed from inside and outside the brewery. Tap Room art by Shawn Bullen. There is another large room available for events where artworks fill the walls. 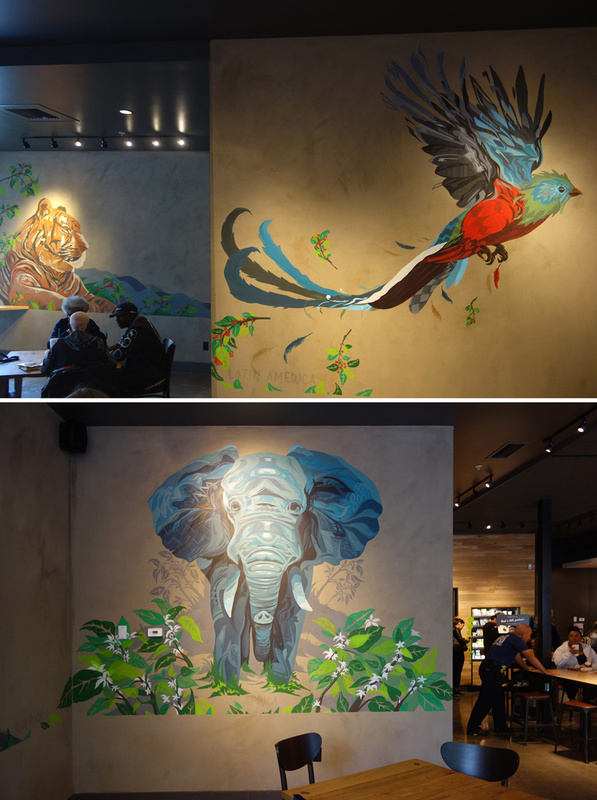 Cameron painted three animals at Starbucks on 3801 3rd St in the Bayview Hunters Point District of San Francisco. 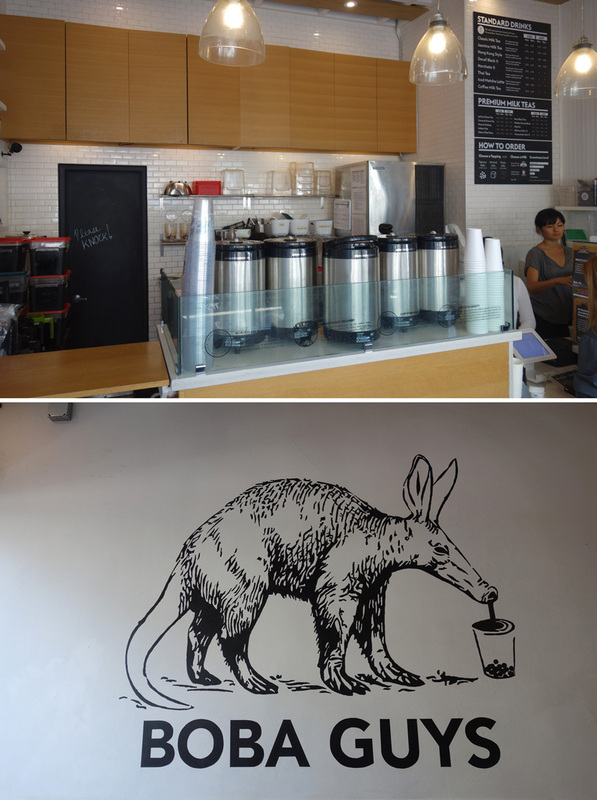 The animals each represent a different coffee they sell. Cameron made this into a very unique Starbucks experience where you can enjoy the renderings you expect in a space like no other Starbucks. Jaxson SF is a country western bar located in the Cow Hollow/Marina on Fillmore at Lombard. The space next to it became available for outdoor seating. When the sun is out it is very pleasant. This outdoor space has limited hours. Art by Apexer. Free Gold Watch is on Waller by Stanyon St in the Haight next to Golden Gate Park. It is filled with pin ball machines. There is also a screen print shop. The mural is actually a lot larger than what you see. But then the shop is more about pin balls. Art by Deb. 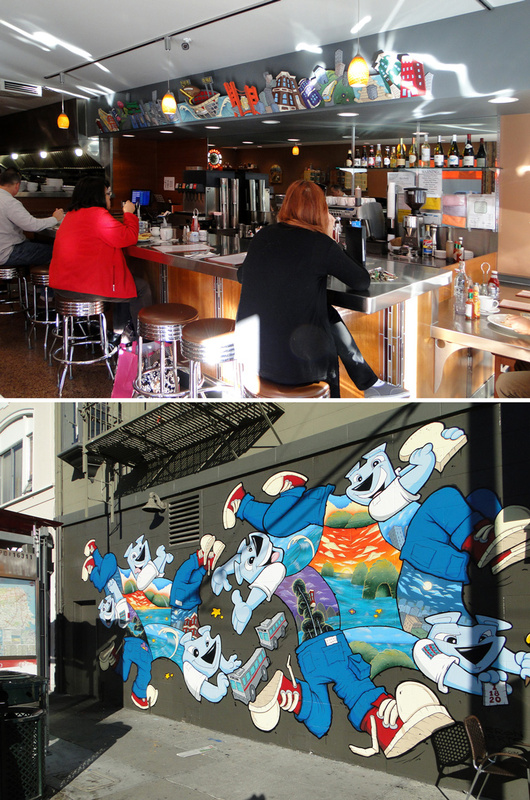 Toast has several locations in San Francisco. They are an American comfort food restaurant that serves breakfast, burgers and salads. This location at 1601 Polk Street is not listed on their site. Sirron Norris also designed their logo. The bottom photo is the exterior. 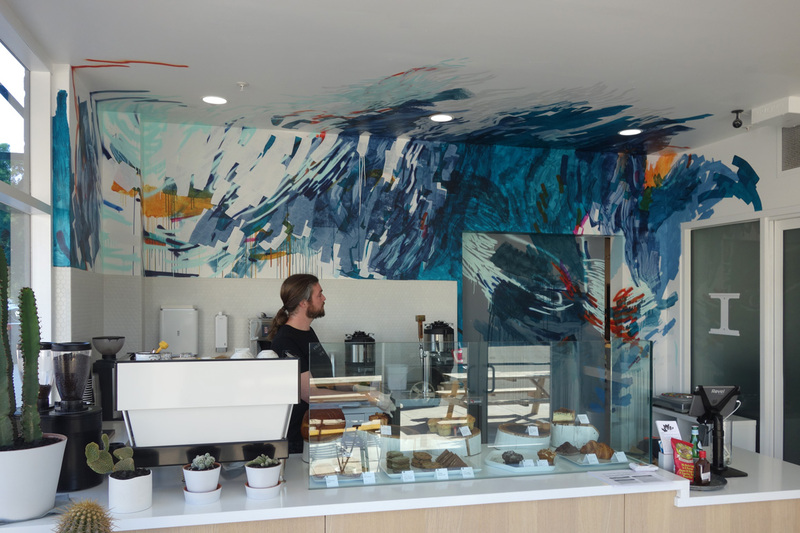 Brendan Monroe painted this mural outside the Boiler Room at Heath Ceramics. 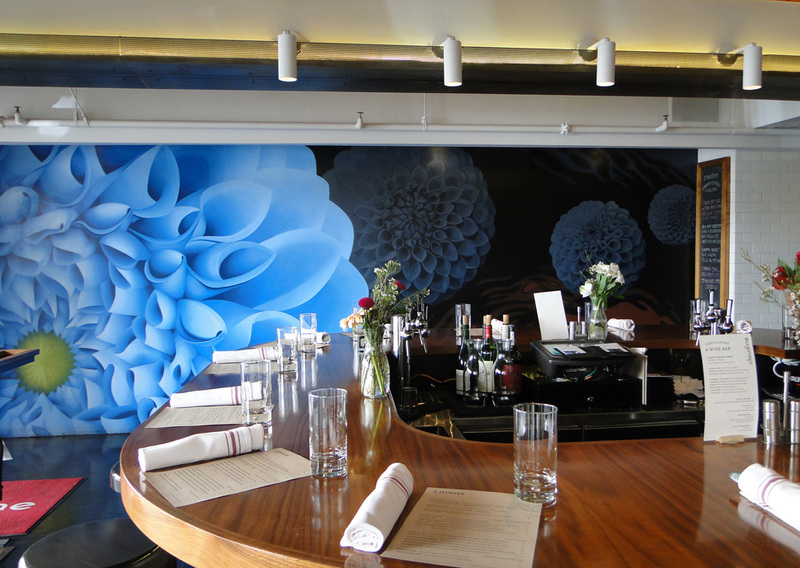 This is an interesting space with Heath Ceramics, Blue Bottle Coffee and now Tartin Manuractory. 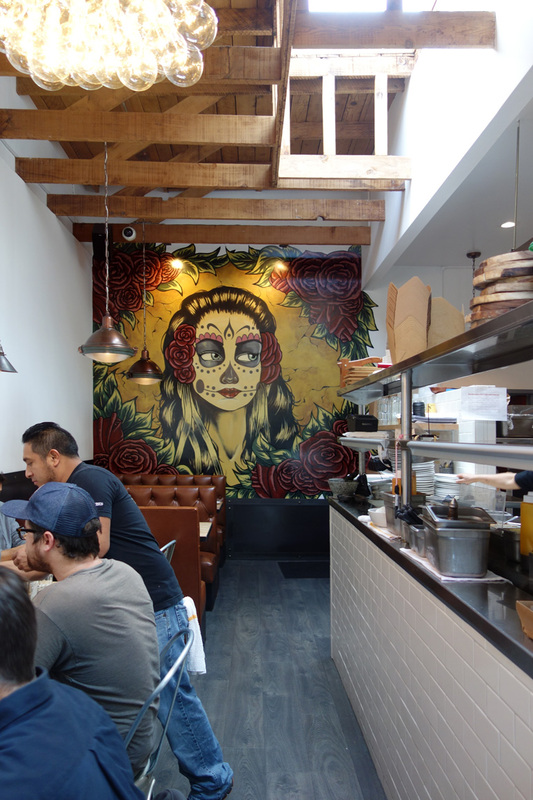 It is located on Alabama at 18th St in the Mission District. Jay Cheesesteak is a very small sandwich shop between Valencia and Mission St on 21st St. 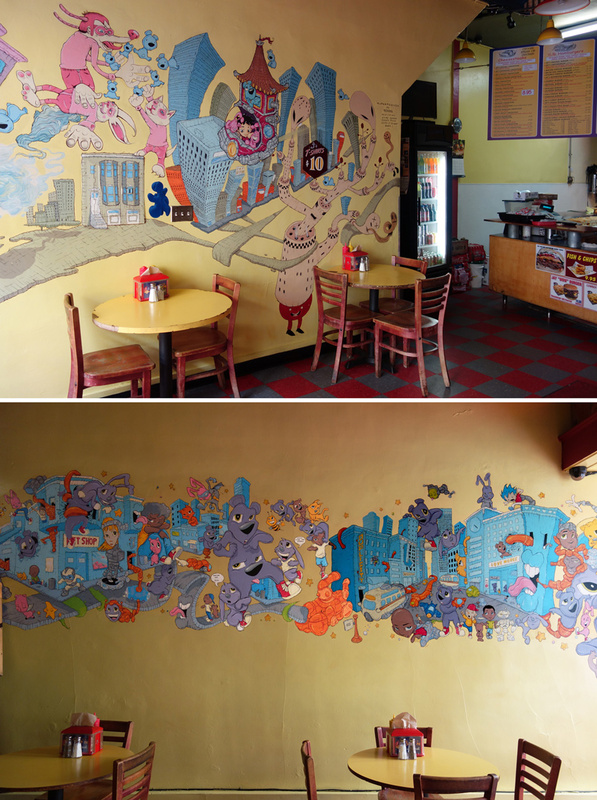 The art is primarily by Sirron Norris with guest appearances by Ferris Plock, Mars-1, Ezra Li Esimont and Nome Edonna. Boba Guys is a tea house with several locations in San Francisco. This is on 19th at Valencia in the Mission. 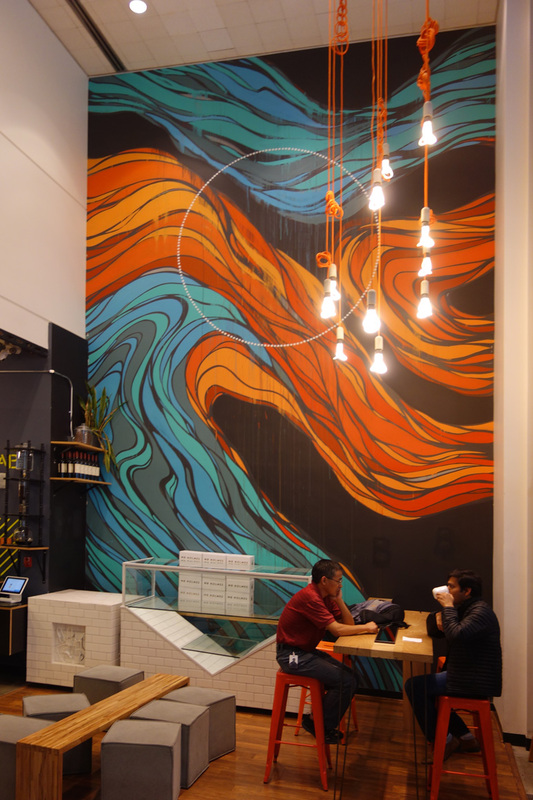 They also have a location downtown and in Hayes Valley. David Young Kim painted the logo that was designed by another artist. It pays the bills! You can find his art in Oakland Chinatown. Papito Hayes is a Mexican restaurant on Hayes St by Gough in Hayes Valley. Hayes Street is fun to walk along. There is other art to see in the neighborhood. Workshop Cafe is located in the heart of the Financial District. It is a cross between a cafe and a workspace where a person can for a fee reserve a space or small room with high wifi access to work or conduct meetings. Who knows it might be where the newest great idea is hatched and developed. 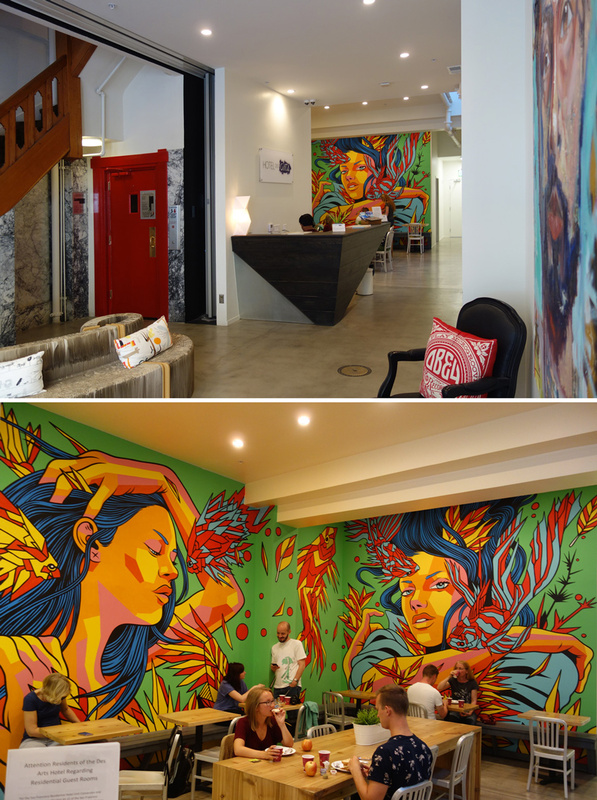 Erik Otto painted this large mural that dominates the entrance and is highly visible from the street. Bicicleta Sem Freio is a Brazilian artist who was in San Francisco for an art show. 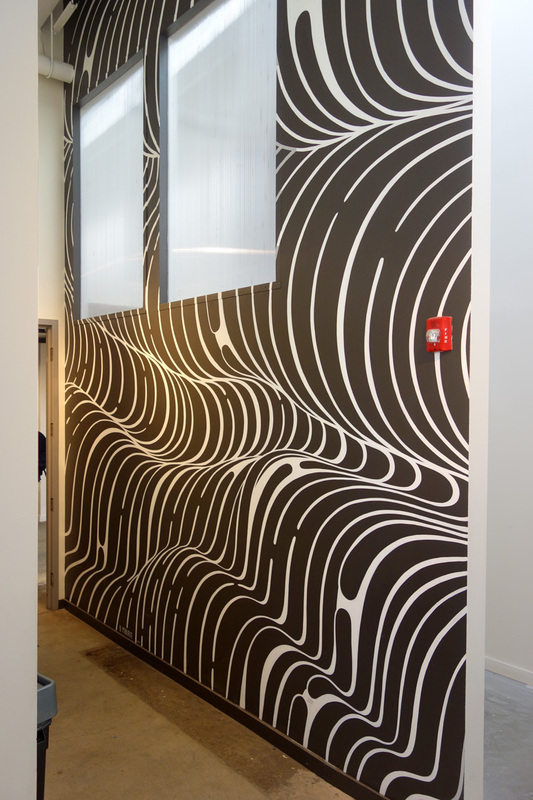 While here he painted this ground floor space in the new lobby at Hotel des Arts on Bush and Grant St in downtown San Francisco. He also painted a mural on the exterior of the hotel. If you don’t know this hotel you should check it out. 38 of the rooms are painted by a different artists. Some of the names are known like Shepard Fairey, Chor Boogie and Jet Martinez. Guests like to book specific rooms. Murphy’s Pub is located on Kearny St at Sutter in downtown San Francisco. It is a traditional pub with bar and pool table inside. 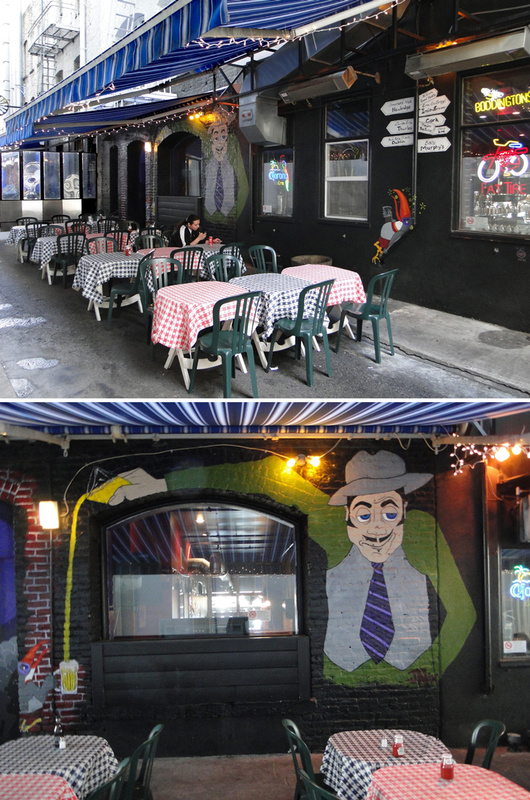 The back side is on Claude Lane where several other restaurants are located. Some also have art on the exterior walls. 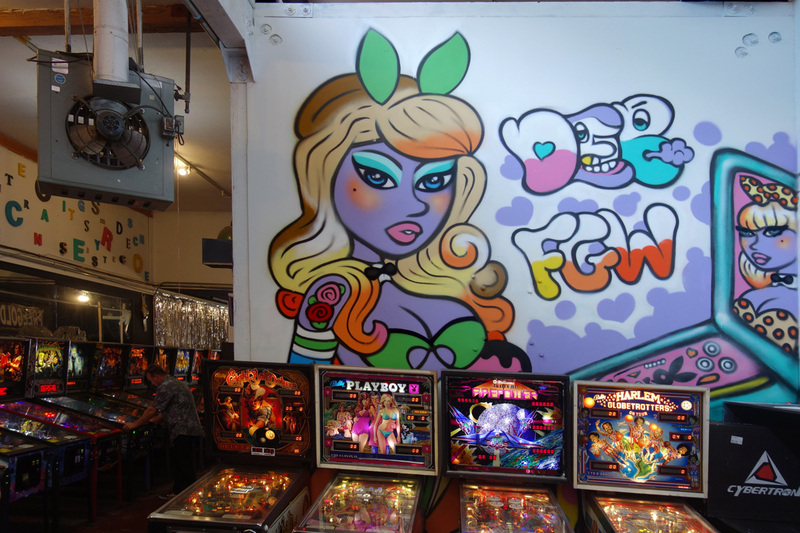 We do not know who painted the character style art on their premise.